Governments aren’t often praised for introducing new costs on an everyday item. But the introduction of the single-use carrier bag charge in Wales has won the support of retailers and consumers alike, says Matthew Quinn from the Welsh Government. With an estimated 445 million plastic bags used in Wales in 2009, the single-use carrier bag had become a symbol of our throwaway society at a time when reusable alternatives are readily available. When the Welsh Government introduced its plans to become a zero- waste nation by 2050, reducing the environmental impact of single-use carrier bags was one of the first steps in the long road ahead. Plastic bags contribute between 0.1-1 percent of visible litter in the UK with around 2 percent ending up on our beaches. Although this may seem small, they are a highly visible form of litter which can take hundreds of years to biodegrade. The Welsh Government recognised that intervention was needed to control the issuing of single-use carrier bags. Following a 2009 poll by the Department for Environment, Food and Rural Affairs, in which 88 percent of respondents said they had 40 disposable carrier bags hoarded at home, consumers needed a strong message about how a small change in their purchasing and disposal behaviours could quickly deliver a large change for the environment. Evidence from countries such as the Republic of Ireland, Bangladesh and China indicated that imposing a charge or ban reduced consumption of carrier bags and litter. Starting as a public petition to address a growing issue, the idea of charging for carrier bags was developed into a proposal that went through the consultation and legislative process, before becoming a law that changed the way single-use carrier bags are thought about today in Wales. At the outset it was important to agree the definition of a single- use carrier bag and what types of bag to include. Is what it’s used for important? What about the thickness of the bag and its size? Should paper and biodegradable bags be included? And what level should we pitch the charge? It needed to be enough to influence behaviour change without placing an unnecessary burden on retailers or the public. Introduced in 2011, the scheme is simple. It places a 5p levy on the purchase of all single-use carrier bags irrespective of the material they’re made from. No retailer is exempt; consumers are charged a minimum of 5p per bag whether packing up the weekly supermarket shop or bagging a Saturday night takeaway. The proceeds of the levy are then donated to good causes. This simplicity was important in winning over the support of retailers and consumers, and it set the Welsh approach apart from schemes in places elsewhere. Last December the parliamentary Environment Audit Committee praised the Welsh scheme as easy for consumers to understand and straightforward for retailers to run. Bags from other materials, such as hessian or cotton, and the stronger plastic ‘bags for life’ are exempt from the scheme. There are a few exemptions to the scheme beyond this. These include, for example, food stuffs that are not pre- packed such as loose fruit or fast food fries. From the start the Welsh Government’s Local Environment Quality team recognised that long-term success depended on backing by the retail sector. Their challenge was to develop a scheme that would work for all retailers, from the big four supermarkets to small-scale independent traders. Early stakeholder engagement and an open-minded approach proved essential to negotiations. The Welsh Government set the wider scheme parameters and worked with the retail sector from the outset to discuss the particulars of how the scheme would work. Some were concerned about the knock-on administrative effects of implementing the scheme. For example, the original proposals required all companies to keep detailed records of net proceeds from charging for carrier bags. Smaller retailers, due to their limited staff capacity in comparison with larger employers, felt this would be an unhelpful extra call on their workers’ time. Following their feedback the regulations were amended to reduce the administrative burden on small and medium-sized enterprises by requiring only those retailers with ten or more full time employees to keep such records. Whilst all retailers in Wales are required by law to charge for single-use carrier bags, several consortia representing the larger retail sectors said they would prefer to see a voluntary approach to the donation of the net proceeds instead of being legally required to do so by the Single-Use Carrier Bags (Wales) Regulations 2010. After a year of negotiations with the sector, retailers entered into a voluntary agreement with the Welsh Government to donate the net proceeds of the charge to a good cause of their choice. Working closely with a range of different stakeholders enabled us to deliver a scheme that meets the Government’s commitment whilst being tailored to the differing needs of retailers across the sector. Reducing the environmental impact of carrier bag usage – from production to disposal – was, and remains, the over-riding aim of the scheme. A Welsh Government study six months in found a 90 percent reduction in carrier bag usage for some retail sectors, while a similar study by the waste reduction agency WRAP recorded an 81 percent fall in usage in the major supermarkets between 2010 and 2012. As a knock-on effect of reduced demand, the manufacture of unsustainable materials fell, road miles shrank through fewer deliveries, and fewer bags in circulation meant that fewer end up as damaging and unsightly litter. Independent research carried out by Cardiff University reported that 82 percent of shoppers claimed to reuse their bags following the introduction of the charge, compared to 61 percent prior to the charge. In March 2013 studies into behaviour trends by Exodus Research reported that 70 percent of shoppers were observed reusing their bags. Yet the benefits reach beyond environmental factors. Retailers are saving money by purchasing fewer bags, and are building community networks through their charitable donations. The Association of Convenience Stores reported that one member had saved up to £14,000 a year: big bucks for a small independent retailer. Meanwhile the Co-operative Group has seen costs fall and an 81 percent reduction in carrier bag usage in their Welsh stores thanks to the scheme. And then there are the beneficiaries of the charge; retailers pass on the money raised through the sale of single- use bags to good causes of their choice, from schools and small local community groups to national charities. As of April 2013, over £4 million has been passed on to good causes since the introduction of the charge. Beneficiaries include the RSPB who have received over £1 million from Tesco as a direct result of the Welsh bag charge. The money has been used to support several Welsh based RSPB projects such as enhancing the visitor experience at the charity’s Carngafallt site. Locally-run charities such as the Snowdonia Society, which received around £800 from a chain of family-run convenience stores in North Wales, are also benefiting. Three years on from the introduction of the charge, the Welsh Government continues to gain insight into how to reduce the usage of single-use carrier bags and to measure the impact of the charge to date. A review of the first three years of the charge is due to start in autumn 2014 and will be undertaken by a specialist independent organisation. 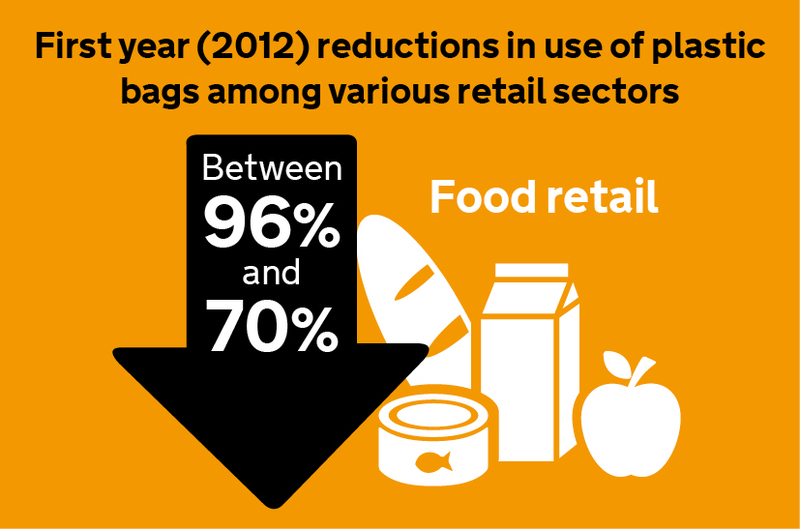 The review will investigate if bag purchasing trends continue to drop, whether single-use carrier bag litter has reduced as a result, the effect the charge has on businesses in Wales, and the effectiveness of the voluntary agreement in encouraging retailers to donate the proceeds of the charge to good causes. Proposals are also in place to cut down further the production of unsustainable materials by bringing other types of carrier bags into the charge. The Environment Bill consultation, which closed in January 2014, included proposals to enable an amendment to the Climate Change Act to bring this into force, if evidence and monitoring demonstrate that there is a need. After success in the supermarkets, the next stage of the Welsh Government's consumer insight work will focus on the high street shopping behaviours of the younger generation. Branded bags by the latest on-trend retailers are as much a fashion accessory as the items they hold. Encouraging youngsters to change their behaviour and opt for more sustainable bags is the next challenge. On 1 October 2011 Wales became the first UK country to introduce a charge for single- use carrier bags. Northern Ireland followed in 2013 and the requirements of the 5p levy there are similar, but not identical, to the scheme in Wales. Retailers in Northern Ireland are required to pass the proceeds of the levy (£4.1 million in 2013/14) to the Department of the Environment. These funds are used to support community- based environmental projects. To encourage shoppers to reuse their bags, the 5p levy will be extended to reusable bags (retailing at less than 20p) in January 2015. Retailers in Scotland will be required to charge for carrier bags from 20 October 2014. The charge will be similar to the Welsh scheme both on the scope of the charge and voluntary donations to good causes, but due to the differences between the Climate Change Act 2008 and the Climate Change (Scotland) Act 2009 there are some administrative differences. The UK Government will introduce a 5p charge in England in the autumn of 2015. The charge will be broadly similar to the Welsh model. However in England it will focus on single-use plastic bags and businesses with fewer than 250 employees will be exempt. The UK Government is developing standards to enable an exemption for biodegradable bags to be introduced at a later date. As is the case in Wales, the UK Government wants and expects retailers to donate the proceeds to good causes. Why shopping centres do not produce cheap clothing bag or jute bag instead of plastic bag. Many countries shopping centres supply bags made of cheap fabrics or may be environment friendly plastic bags. If they give contract to produce environment friendly bags it will be another medium size business sectors which will create more jobs. I recently went on holiday to Wales and only purchased 1 plastic bag. I have a foldaway material bag and for the first time used it!, I didnt need to buy plastic bags. I noticed most people carried an alternative bag. I believe it is a good idea to charge for plastic bags. A very interesting article, but I am sad to hear that England is planning a watered down version of the Welsh model with exemptions for a large part of the retail sector. It is also not clear how enforcement of the "expectations" on retailers will work. Is there to be an army of mystery shoppers going round checking whether they are charged or not? we had no control over. Instead of making people pay to encourage them to use less DONT have them at all. I can see this has definitely changed people's behaviour. A brilliant idea which has been implemented very well. Bit out of topic: Not sure if there's should be so many Fast Food though esp Not close to the School like the one in Round about on the way to Crosskeys. Hey Thanks, for sharing nice post with us. There is a need to keep external parties to be guessing as to what the institution or the self might be planning to do. It is also necessary for these concerned parties to be able to answer properly to the constantly changing needs and demands of its audiences or markets. These steps might not be a guarantee for one’s instant success but it will definitely help one to reach its goal more efficiently. How does the consumer know if a retailer employs less than 250 staff? Welsh carrier bag charge, which is expected 5p for the purchase of any single-use carrier bag.